Learn how to make the Habitat Cardigan step-by-step in this beginner crochet sweater video tutorial! Reference Part 1 and Part 2 of the free pattern while you work along with the free video lesson. Alternatively, you can purchase the ad-free, printable PDF of the complete pattern for $2.75 here. This beginner crochet sweater video tutorial is part of an ongoing collaboration with my friends at Lion Brand Yarn. This post may contain affiliate links. I’ve loved seeing so many of you get started on your Habitat Cardigans since I shared the free pattern a few weeks ago. (If you’d like to show off your stitches too, tag me on Instagram! @makeanddocrew) As I was editing the video tutorial this weekend, I was reminded of how legitimately simple this crochet cardigan is. A series of basic rectangles come together to form a super comfy, drapey, effortlessly cool sweater–and it’s no harder than crocheting a scarf! What if my gauge isn’t the same as what’s listed in the pattern? Getting the right gauge is what will ensure your cardigan is the same size as the measurements listed in the pattern. This sweater has a significant amount of positive ease, so if you’re off by a smidge, it’ll likely still work out. If you’re off by more than a stitch or so though, I recommend changing your hook size to adjust the tightness or looseness of your stitches. Keep in mind that the sweater will stretch a bit once worn, so if necessary, I recommend erring on the side of a slightly smaller rather than larger gauge. Can I substitute a lighter/heavier yarn? 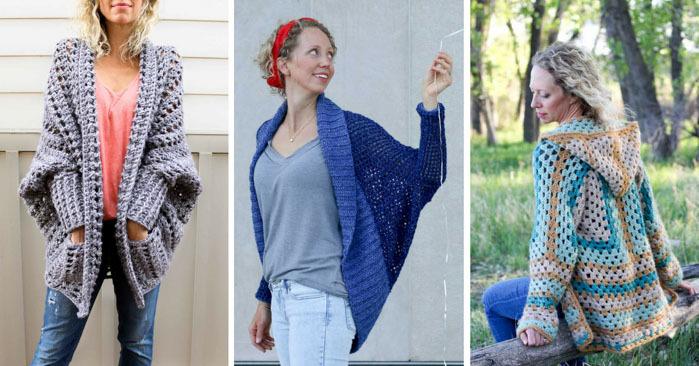 You can even grab a kit from Lion Brand with all the yarn necessary to make your Habitat Cardigan, plus a copy of the printed pattern here. Can I work extra rows to make it longer? Sure! If you finish your rectangle rows and see that your rectangle is a bit shorter than the dimmensions listed in the pattern, feel free to work some extra rows until it’s the correct size. Or if you just want a longer overall sweater, work extra rows of the “tush extension,” just make sure to crochet an odd number of rows so that you end with a RS row. Will this crochet sweater fall off my shoulders? Some shrug-type sweaters tend to be a bit back heavy and therefore fall off your shoulders easily. The Habitat Cardigan has a pretty substantial collar in the front though that helps serve as a counterweight to keep the sweater comfortably in place. I can’t wait to make more crochet sweaters! Got any other beginner crochet sweater patterns?! • The Dwell Sweater is a chunkier weight cousin of the Habitat Cardigan and also includes a full video tutorial. • The Stonewash Shrug is a great four-season cardigan made from extremely soft Lion Brand Jeans yarn. 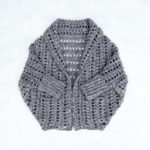 • The Campfire Cardigan is made from two simple hexagons and is super fun to “build” out of basic shapes. 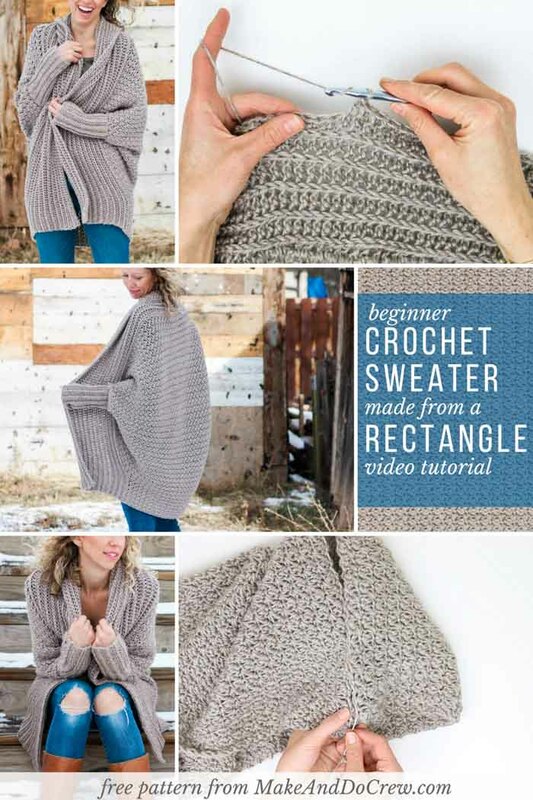 Alright, I really hope you make something you’re proud of with this beginner crochet sweater video tutorial! I wore my sweater around NYC last week for my visit to Lion Brand and it felt like a great big hug–a hug that I MADE MYSELF! Woohoo! Purchase the ad-free, printable PDF with Parts 1 & 2 of the pattern for $2.75 here. Pin this easy crochet sweater video tutorial for later here. If you enjoyed this pattern or found the video helpful, I’d love for you to pin it or share it on Facebook so more crochet addicts can find it too. Thank you! Tutorials I will definitely make this. You’re welcome, Terry! Happy crocheting! The video is great, Jess. 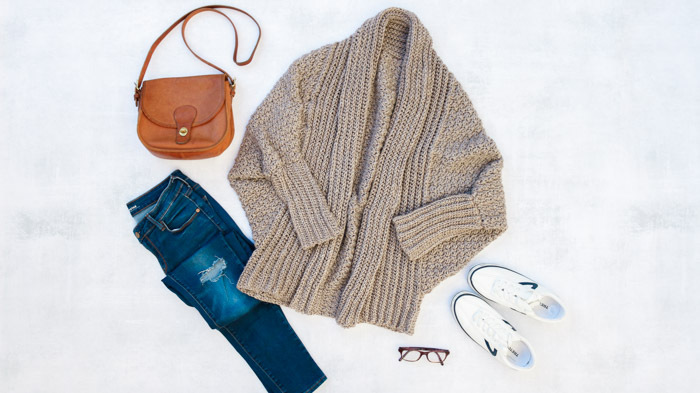 I can hardly wait to make this sweater! Where is the video? I can’t find it! Thanks! Thank you for video Jess. You’re welcome, May! I hope it’s helpful! 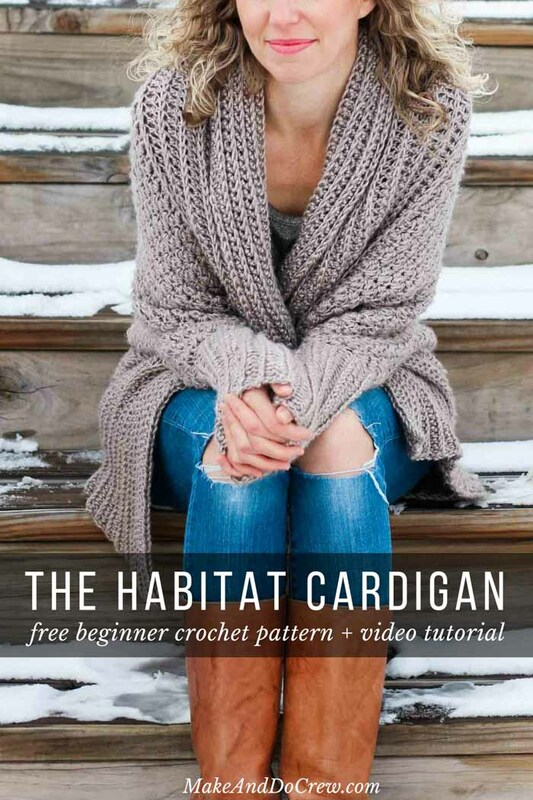 I would like to download the video for the Habitat Cardigan but I am unable to. I’m sorry, my video tutorials are not available to download, but you are able to watch them directly on my site. Are you having trouble watching them here? Eh, I think it’ll totally be okay! I’d just add one extra row to the tush extension so that you’re ending with a RS row. Make sense? IS There anyway you could better explain how to get gauge for the body of the sweater? It says 10 stitches by 10 rows is 4”. So 10 Suzette stitches equals 4”? Or is the 4” comprised of sc and dc stitches? The gauge is 10 total stitches, worked in the Suzette pattern. So it’s a combo of sc and dc as described in the main rectangle section. Essentially, to make a gauge swatch, I’d ch about 13-15 stitches in that main rectangle pattern and work several rows and then measure to make sure you have the same number of stitches and rows per inch. 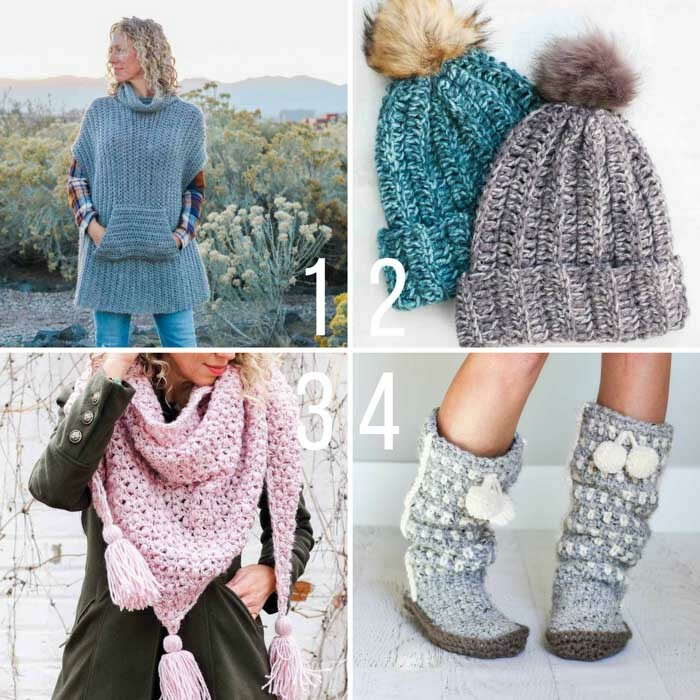 Thank you for this pattern–I love it and hope to make it, but need a bit of help. I’m new to worrying about gauge because I’ve never made anything that needed to fit better than a scarf. If I understand this correctly, if I crochet the same number of rows as the number of stitches, I should end up with a square. When I measure my 10 stitches by 10 rows, I end up with a piece that is 4″ x 3″. My stitches are taller than my rows are wide. Any idea how I can fix this? I am using a lightweight yarn (#3) and a M hook. It sounds like your yarn is lighter weight than what I used in the sample, which is a category 4. If you have access to a worsted weight yarn (cat 4), I would go for that as it’ll just be easier to accomplish a successful garment. If you have your heart set on this yarn, you can always work additional rows of the main rectangle in order to make it the final dimensions listed in the pattern. You may also need to work a few extra rows for the sleeve rectangles and collar. Good for you for checking your gauge on your first garment! Most people skip this step and it’s so important! I just LOVE your patterns!!! Thank you! Can you tell me the size of your model and the size sweater she is wearing? I am making a size small for a client whose elbow to elbow measurement was 29”, and it’s not fitting oversized like your finished pictures. Help! I’m doing something wrong! I’ve tried many times over the last 5 weeks to make this sweater. I know it’s not rocket science and I know I am capable! Even though I’m a beginner, I’ve successfully made 6 ponchos along with many other crochet projects. Tried the gauge three different times, using the same yarn as you and the proper size hook and each time I end up with a 4×3. I then purchased the pattern so I could see all of the measurements and tried adjusting by adding stitches to the foundation chain but it kept working up to be too large. On my third attempt, I tried different sized hooks and that didn’t help either. On my last two attempts, I made the foundation row and row one long enough to meet the width needed for a size S/M, measuring carefully after the foundation and after the first row, the measurement was accurate. After adding a few rows on both attempts, it grew by 2 and 1/2 ” each time (I am careful to not stretch the yarn while measuring). Since I am new to crochet, I don’t know if this is normal? Have I handled the yarn so much that it is stretching more? 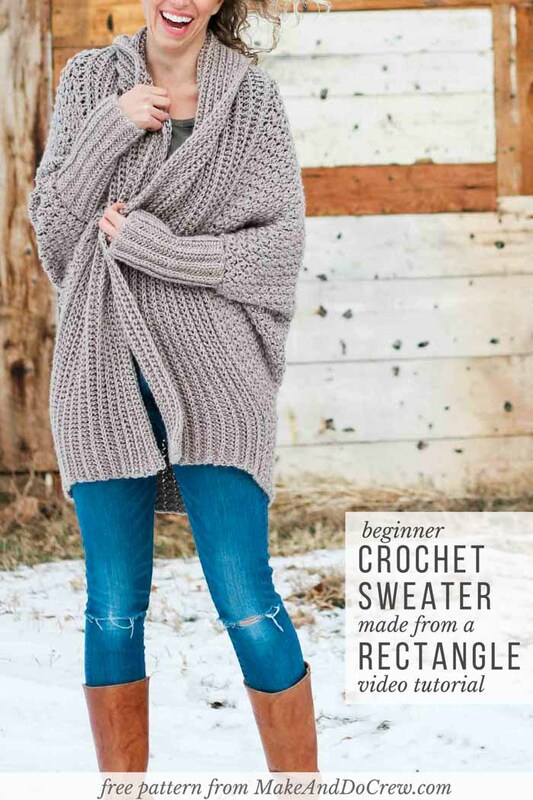 I was going to just give up but it’s such a beautiful sweater and your instructions and video make perfect sense; hoping I am just missing something as a novice. I think you should stick with it! 🙂 The most impt gauge to get right is the width. So before doing the super long chain for the actual sweater, I’d make a gauge swatch like you did (prob like 20 stitches so you can really measure the middle four inches). Change your hook up if you need to to achieve the correct gauge. Then go ahead and start the rectangle. If, once you finish all the rectangle rows in the pattern, your rectangle is too short, simply add more rows until it’s the right height. Does that make sense? This pattern is pretty forgiving size-wise, but you want to get in the ballpark so it can fit as pictured in the photos. Love this sweater and so excited to try it! Question about the yarn – what color did you use in this picture? I love the color and would like get this exact one! Thanks! Stupid question when you say elbow to elbow do you mean arms by your side ? I’m a begginner and very excited to star! Thanks so much for this video, it’s very complet and easy to understand! I’m an experienced crocheted, but I still missed something. I’ve made this, slightly modified, out of Lion Brands “Jean’…and I love it! But when I went back to the video for the sleeves, I noticed that you were crocheting in (what you called the front loop). I know that as the THIRD loop. The FRONT loop would be on the top stitch closest to you. Front loop, back loop and THIRD loop. So of course my oversized collar will look a little different than my cuffs, which is fine,. Just wish I would have caught that sooner! Love the pattern and all the work that you and the ‘crew’ have put in! Thanks!